As we noted in Part 1 of this article, the torque converter, like the fluid coupling, was invented by Hermann Föttinger, then an engineer for the shipbuilder Stettiner Maschinenbau AG Vulcan, and is described in Föttinger’s original 1905 German patent application for hydraulic couplings. Early torque converters were first used for large ships and were later applied to trains, buses, and some stationary industrial engines. The first production automotive application of which we’re aware was the 1946 Invicta Black Prince, which used a Brockhouse Turbo Torque Converter transmission. The Black Prince was produced in very limited numbers through about 1950, but Brockhouse (today known as BH Transmission Services Ltd.) continued to build torque converter transmissions for various other applications, including tractors. A torque converter is a type of fluid coupling and operates in a similar manner. The fundamental distinction is that while a fluid coupling can only function as a clutch (hydraulically connecting an engine or prime mover to an output shaft), a torque converter can serve as both a clutch and a transmission, capable of multiplying input torque where a simple fluid coupling can only transmit it. In fact, in some bus and railway applications, torque converters are used solely as transmissions, with a separate clutch — friction or fluid — serving to connect the converter to the engine. In Part 1 of this article, we explained that a fluid coupling consists of two torus-shaped bladed discs facing one another in an oil-filled housing. 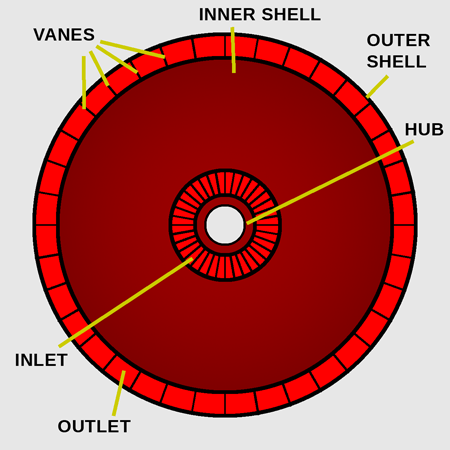 The engine turns one torus, the impeller (or pump), whose motion is transmitted through the oil to the other, driven torus, called the turbine, which in turn drives the output shaft (or, in a typical automotive transmission, the transmission gears). Some of the engine’s power is lost to heat, or slip, within the moving oil. That’s the simple version. 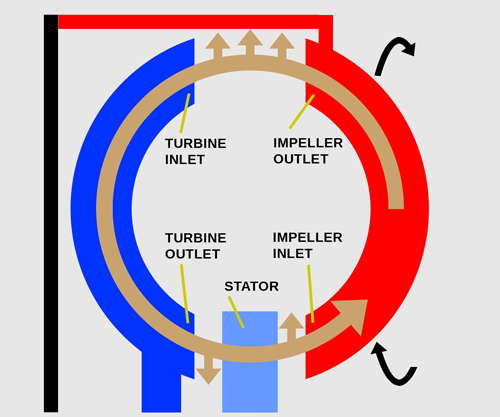 The more complex explanation is that the rotation of the impeller and its blades sets up two distinct flow patterns within the coupling’s operating fluid, each in a different plane: rotary flow (sometimes called circumferential flow), which is in the direction of engine rotation, and toroidal flow (sometimes called vortex flow) between the impeller and turbine. 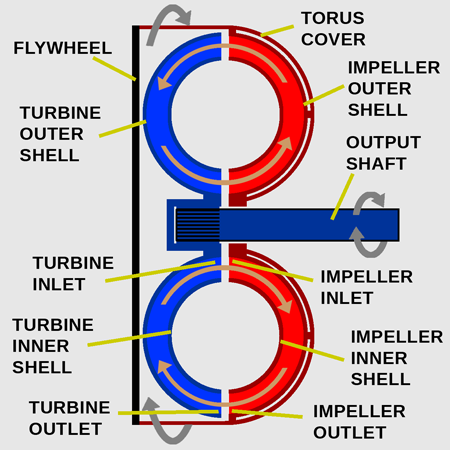 As the name implies, toroidal flow follows the inner curvature of the impeller and turbine tori, moving outward from the impeller’s inner hub to its outer circumference, then from the outer circumference of the turbine to its inner hub and back again. While rotary flow is a product of the impeller transferring its rotary motion to the coupling’s incompressible working fluid, toroidal flow is mostly a function of inertia and pressure. Because the impeller and turbine are not mechanically connected (unless the coupling has a lockup clutch), any change in the momentum of either torus must be transmitted through the oil. Doing so requires overcoming the inertia not only of the turbine, but also of the intervening oil, different areas of which may be moving at different speeds. That doesn’t happen instantly or all at once. Instead, oil propelled by the impeller blades sets up a high-pressure area as the fast-moving oil collides with and transfers its angular momentum to the slower-moving oil around it. This creates a ring of fast-rotating oil that expands both forward and outward into lower-pressure regions of the coupling. When that oil reaches the turbine inlet, the oil’s forward momentum carries it along the inner curvature of the turbine torus toward the hub and then back toward the inlet of the impeller torus, thereby setting up a toroidal motion. The forward component of that oil’s velocity — and thus the strength of the toroidal flow — is proportional to the difference between the pressure in and around the impeller and the pressure in and around the turbine, just as the speed of a gust of wind is proportional to a difference in atmospheric pressures. The pressure differential is proportional to how fast the impeller and turbine are rotating relative to one another. 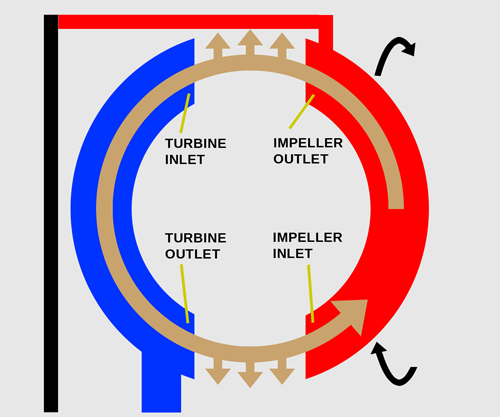 If the turbine is turning significantly slower than the impeller — either because the impeller has accelerated or the turbine has slowed down for some reason — the pressure within and around the turbine will also be significantly lower, so the incoming oil will have a greater forward velocity. Conversely, if the respective speeds of the turbine and impeller are very close, the oil’s forward velocity will be low. Either way, the incoming oil also has substantial angular momentum. As it passes through the turbine, the oil will therefore apply torque to the slower-moving turbine blades. In keeping with Newton’s Third Law of Motion, the turbine blades exert an opposing reaction torque on the oil. That torque is again proportional to the difference in angular velocities. If the turbine is stationary or turning very slowly, much or all of the fast-moving incoming oil will essentially bounce off the turbine blades, reversing the oil’s rotational direction. Consequently, if the impeller is rotating clockwise, some or all of the ‘backwash’ of toroidal flow from the turbine will have a counterclockwise rotation and vice versa. Toroidal flow ≈ energy-wasting ‘backwash’ from the turbine. If turbine speed is a lot slower than impeller speed, this backwash is strong. If turbine speed is close to impeller speed, the backwash is low or minimal. These flow patterns are present in both fluid couplings and torque converters, but in a fluid coupling, toroidal flow can only decrease efficiency. 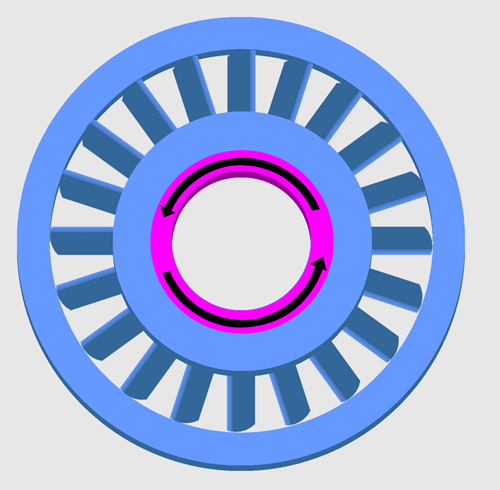 A torque converter, on the other hand, uses strong toroidal flow to advantage by adding reaction blades or guide blades to manage oil flow between the turbine and the impeller. Each set of reaction blades, commonly called a stator, is mounted on a disc carried on a fixed shaft. In most automotive applications, the stator disc is rotatable, but a one-way clutch allows it to turn only in the same direction as the impeller and the engine. When the turbine and impeller speeds are nearly equal and toroidal flow is minimal, the oil’s angular momentum is already in that direction, so the stator just spins freely. However, if the turbine speed is significantly slower than impeller speed and toroidal flow is strong, the ‘backwash’ of oil leaving the turbine will try to turn the stator backward. This negative (reverse) torque locks the stator against its one-way clutch. The now-stationary stator blades exert an opposing reaction torque on the oil, again reversing its angular direction. 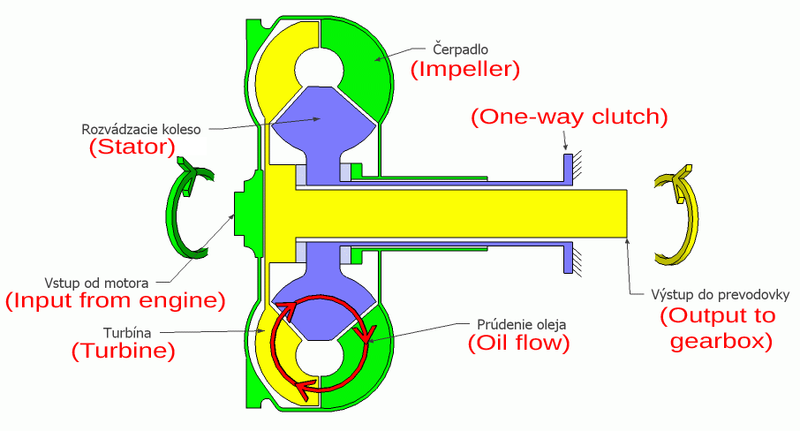 In simpler terms, the moving oil bounces off the stationary reaction blades before reaching the impeller. Since the angular velocities of the returning oil and the impeller are now in the same direction, the returning oil’s angular momentum actually serves to accelerate the rotary flow of oil through the impeller. This effectively multiplies the engine’s input torque, enabling the impeller to apply more torque to the oil than the engine actually exerts by itself. Unlike mechanical reduction gears, the multiplication provided by the stator (or stators — a torque converter can have several, redirecting the returning oil more than once) is not a fixed ratio. Since it requires strong toroidal flow, it varies based on the relative speeds of the turbine and impeller. The difference between those speeds is greatest at the instant just before the turbine first begins to turn, a point known as stall speed — technically defined as the instant engine torque multiplied by the converter precisely equals the load on the output shaft. Not coincidentally, that is also the point of maximum torque multiplication (the converter’s stall ratio). Once the turbine is moving, toroidal flow drops off and the reaction torque the turbine exerts on the oil gradually decreases, which causes the ‘backwash’ of oil exiting the turbine to hit the stator blades at a progressively shallower angle. Torque multiplication fades until eventually the torque the ‘backwash’ exerts on the stator is more forward than backward (i.e., positive rather than negative), which allows the stator to unlock and freewheel. If there are multiple stators, each may freewheel at a different point. With the stator(s) unlocked and spinning freely, torque multiplication ceases and the converter’s effective ‘gear ratio’ is close to 1:1. However, any abrupt increase in either engine speed or load (for example, if the driver floors the accelerator or if the vehicle goes up a steep grade) will cause the speed of the turbine to momentarily lag behind that of the impeller, which again increases toroidal flow within the converter. If that flow is strong enough, it will lock the stator(s), which causes torque multiplication to resume. The effect is comparable to downshifting a conventional transmission. While a torque converter’s ability to multiply torque in this way is useful — in fact, the impeller and turbine blades of most torque converters are curved in opposite directions to maximize the fluid reversals — it’s not without drawbacks. One limitation is slippage, which is naturally high during torque multiplication. Another disadvantage is that with a torque converter, as with any continuously variable transmission, the relationship of engine speed to road speed is no longer linear. That can result in brief but sometimes frustrating delays where engine rpm soars with little or no immediate effect on the vehicle’s momentum.